An essential high finance drama. 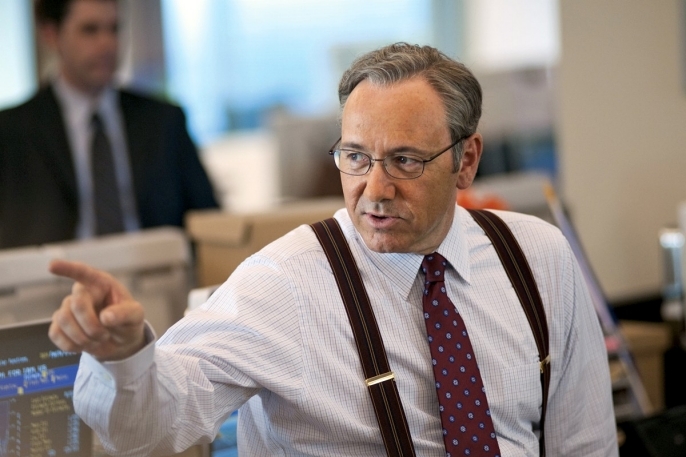 Margin Call, told in a 36-hour timeframe, is an intelligent exploration of unchecked white collar crime. It serves as an unofficial account of the 2008 economic meltdown as seen through the guise of a fictional Wall Street firm that resembles the Bear Stearns follies. The players here – enacted by Kevin Spacey, Simon Baker, Paul Bettany, Zachary Quinto, Demi Moore, Stanley Tucci and Jeremy Irons – are either fully aware or in denial that their money investment firm deals and trades paper with invisible value. Playing God seems to be an entitlement for most of them. Risk management analyst Peter (Quinto) comes up with an equation that forecasts collapse of their company. Past dark, he summons up his disbelieving boss Will (Bettany) to the office. 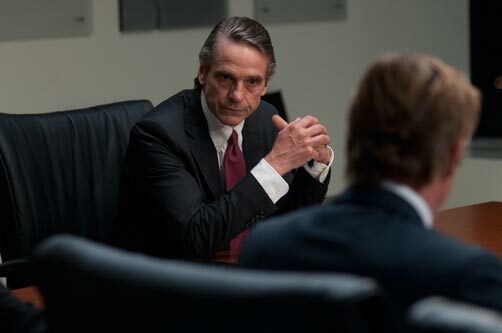 Then, others are called to verify the seriousness of the situation, and finally CEO John Tuld (Jeremy Irons) arrives at 4 o’clock in the morning, via helicopter onto the building helipad, with an imperative that will cheat millions out of unwitting investors. It’s what you call a fire sale, the selling of mortgage securities that are worth nothing. And it doesn’t matter to this CEO that the trickledown effect will hurt the global economy. “It’s just business,” Tuld explains to his second in command Sam Rogers (Spacey). Sam ineffectually warns Tuld that he will never be trusted by high financiers ever again if he continues this route. Tuld muses that he became rich on more than just book smarts, but on the gift of killer instinct. He selects the unwilling Sam as the fall-guy in case the firm is put under likely investigation, and has sealed the fate for his other executives. The others await the promise to be handsomely paid to perform damage control roles in the projected future, and to sign affidavits to not talk or side with law investigators or journalistic press. Insinuations are made by Tuld that he will destroy anyone who does not cooperate. Many others will be fired from the boiler room, but he has devised promotions for a few. You look around for key individuals who possess a moral conscious to say something in protest. The sympathetic figures portrayed by Quinto and Tucci offer the most hope to raise voice against the unethical greed. Then you look at the sobering guilt but professional gusto of Sam Rogers. Watching Kevin Spacey in this role as Sam Rogers is yet another revelation in his career. You look at him as a guy who is just ten years away from a heart attack (Or a suicide like Enron’s Kenneth Lay?). Spacey, a master at multi-meanings, delivers a compelling speech to his boiler room personnel that drives at motivating them and hinting to them, ever so discreetly and succinctly, that they are selling out their professional integrity at the same time. That’s some monster balls. The remarkable debut film by J.C. Chandor, “Margin Call” deserves Academy Award consideration for the screenplay and Spacey for Best Supporting Actor. I’d say it is just a little too stark and dour in its visual appearance. It invites your high-functioning brains but leaves the heart cold. For this story material, that’s OK, as long as you’re up for it. 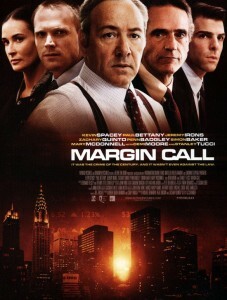 Film Cousins: “Wall Street” (1987); “Enron: The Smartest Guys in the Room” (2005); “Up in the Air” (2009); “The Company Men” (2010).